Could it be that Bank of America is better run than Wells Fargo? Let's not go that far. But BofA may be doing better than you think. 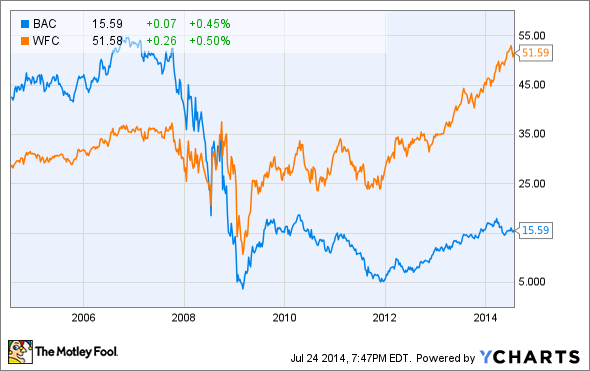 Bank of America (NYSE:BAC) has had a tough run over the past decade. Just looking at the bank's stock chart will cause the long-term investor to cringe. The reasons for this horrid run are plentiful. There was the real estate bubble and the financial crisis. There was the unequivocally terrible Countrywide acquisition. There was Occupy Wall Street. And most recently the bank had to restate its capital calculations due to an internal spreadsheet error. On the other side of the coin sits Wells Fargo (NYSE:WFC), the largest U.S. bank by market cap and the gold standard for banks from coast to coast. Wells handled the financial crisis like a mere speed bump to its rise to the top of the investing world. Through some combination of superior management and old-fashioned good luck, the bank has sailed through the past 10 years unscathed. Ask any bank investor out there which of these two megabanks is the best and most would say Wells Fargo. In the video below, Motley Fool contributor Jay Jenkins doesn't necessarily disagree that Wells is the better run bank. He does, though, point to an important metric of bank profitability in which Bank of America is doing better than you probably expect. Yes, Wells Fargo does have a better net interest margin than Bank of America, but its not by much, and over the next five years Bank of America may very well catch up and take the lead. Click play below to find out what Jay means by net interest margin and exactly how Bank of America and Wells Fargo stack up.